In this video we will discuss how to implement bidirectional sort in Angular JS. 2. The user should be able to sort in both the directions - ascending and descending. Clicking on the column for the first time should sort the data in ascending order. Clicking on the same column again should sort in descending order. sortColumn and reverseSort properties are attached to the $scope object. These 2 properties are used to control the column by which the data should be sorted and the sort direction. sortColumn is set to name and reverseSort is set to false. This will ensure that when the form is initially loaded, the table data will be sorted by name column in ascending order. Depending on the column header the user has clicked, sortData() function sets the sortColumn and reverseSort property values. Based on the sort column and the sort direction, getSortClass() function returns the CSS class name to return. The CSS class controls the sort icon that will be displayed next to the sort column. $scope.reverseSort = ($scope.sortColumn == column) ? 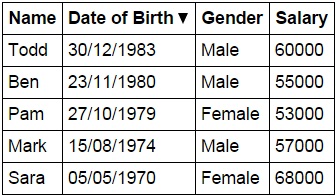 HtmlPage1.html : sortData() function is called when any table header is clicked, passing the name of the column by which the data should be sorted. The div element's, ng-class directive calls getSortClass() function, which returns the CSS class to be applied. The CSS displays the UP or DOWN arrow depending on the sort direction. Finally, with the orderBy filter sortColumn and reverseSort properties of the $scope object are used to control the column by which the data should be sorted and the sort direction. Styles.css : CSS styles to make the form look pretty. What is bootstraping as you mentioned this word so many times in angularJS tutorials.Is it adiffrent technology all together? Sir the arrow up and down doesn't show on the th can you help me? I am also not able to see triangles on th element. How you managed?? I don't understand how angular knows when to reevaluate getSortClass. I see it gets called at every table header click for all div elements. But how does angular know, can you explain? I am not sure. But what i can understand is ng-click is common for the th element. getSortClass is under the th element. So, I might get executed automatically as the click event is for whole th element. Hi Thanseem nazar i have also faced the same . To resolve this problem i used the following steps. 1) In goolge chrome -> settings -> Cache Images and files: I have cleared cahe data. If you face the issue with other than chrome there also clear images and files..